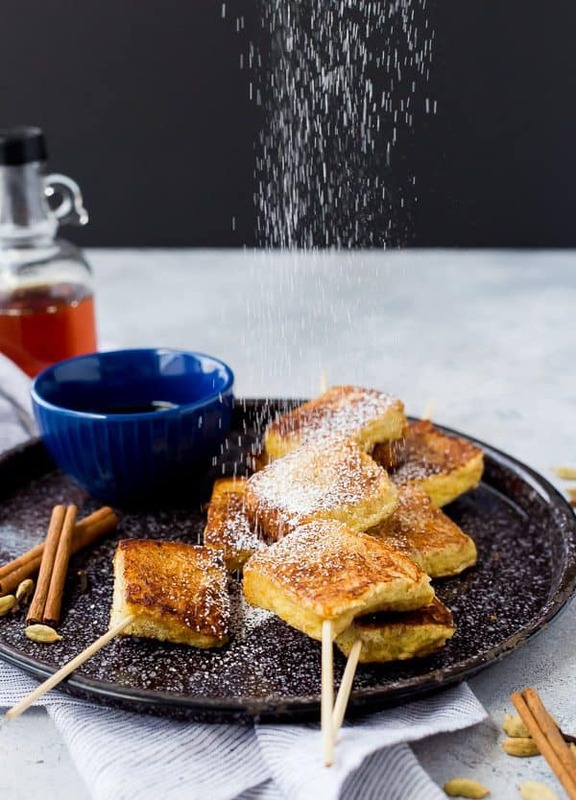 Christmas morning brunch just got an add-on item, because you’re going to want to have these French toast skewers on the menu. 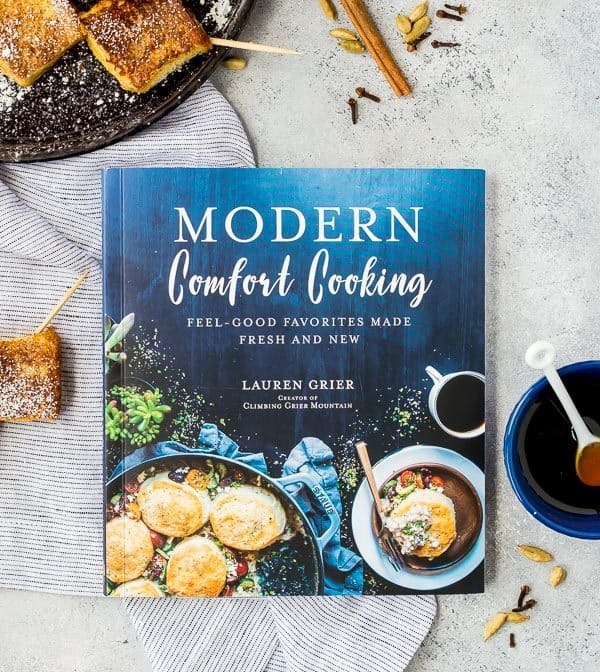 The recipe comes from Lauren Grier’s first cookbook titled Modern Comfort Cooking, and the book is a beauty! Luckily for you, she asked if I wanted to take a sneak peek at the book and share a recipe with you guys, because this one is a winner! Before landing on this recipe, it was so fun to look through this book that’s full of super unique takes on comfort food classics. Lauren mentions in the description that she’s normally on team savory when it comes to brunch. I’m on the same team, so I figured if it was good enough for her, it was good enough for me too. I loved Lauren’s tip about how to make these ahead and reheat, and I knew you’d all love that tip too. 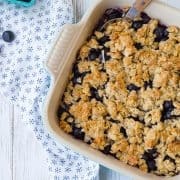 When it comes to breakfast or brunch recipes, that attribute of a recipe is HUGE and so helpful when you’re trying to get stuff prepped for an early(ish) morning meal. Chai. French. Toast. Who wouldn’t want that? 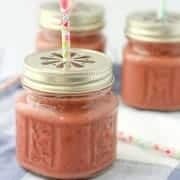 I’m happy to say that the recipe did not disappoint! It was easy to make and the warm chai flavors had me going back for just one more piece over and over again. 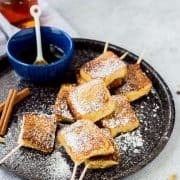 The kids loved this recipe too – we went on a major French toast bender after I found some nut-free Texas toast. 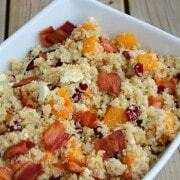 If you’re still rounding out your holiday brunch menus, make sure to add this one to the list! And don’t forget to check out Lauren’s book (it would make a great gift, especially for the more adventurous cooks/eaters in your life!). 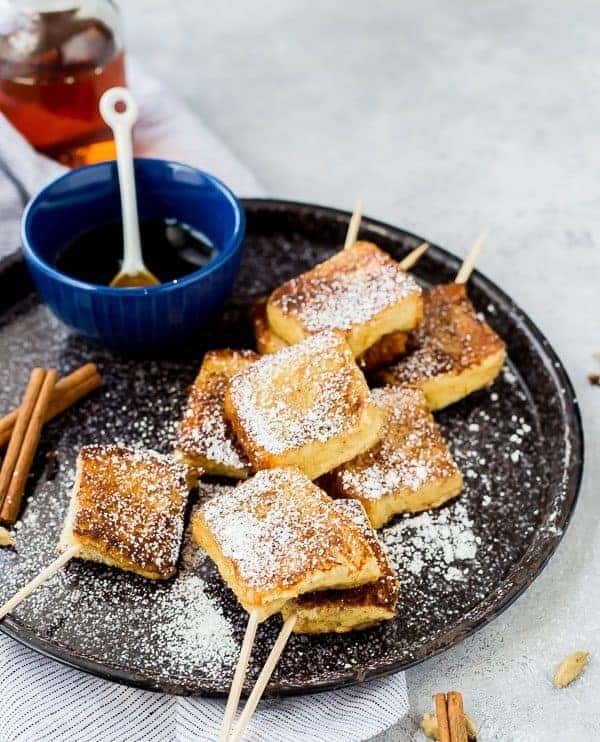 If you’re in search of a more traditional French toast, don’t miss my classic French toast recipe – I cover all the tips to make perfect French toast! These skewers can be assembled and made ahead of time. To reheat, simple preheat your oven to 375°F and line a baking sheet with foil. Spray the foil with nonstick cooking spray and place the skewers on the baking sheet. Place the baking sheet into the oven for about 5 to 7 minutes or until heated through. I used 2% milk in place of whole milk and they turned out great. Make sure to cool the chai tea slightly before stirring into egg mixture – you don’t want it to be boiling hot or it will cook the eggs. The yield of this recipe as written in the book is 4 skewers. Depending on what else you’re serving, I think you could get up to 8 servings out of this recipe. Nutrition information is calculated for 8 skewers, or one full slice of Texas Toast. 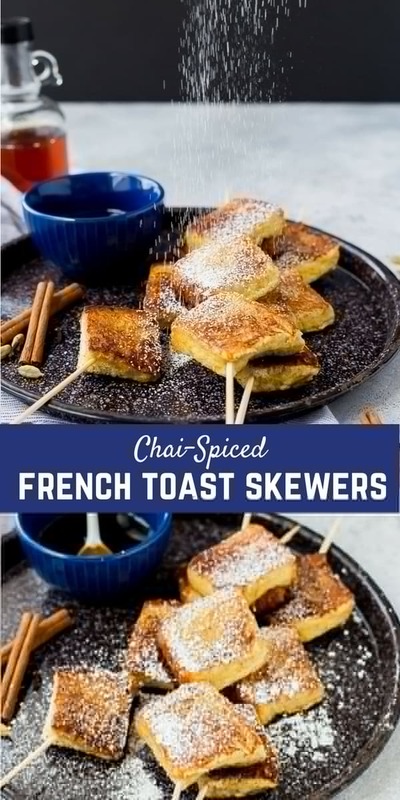 Verdict: I looooved this Chai French Toast! 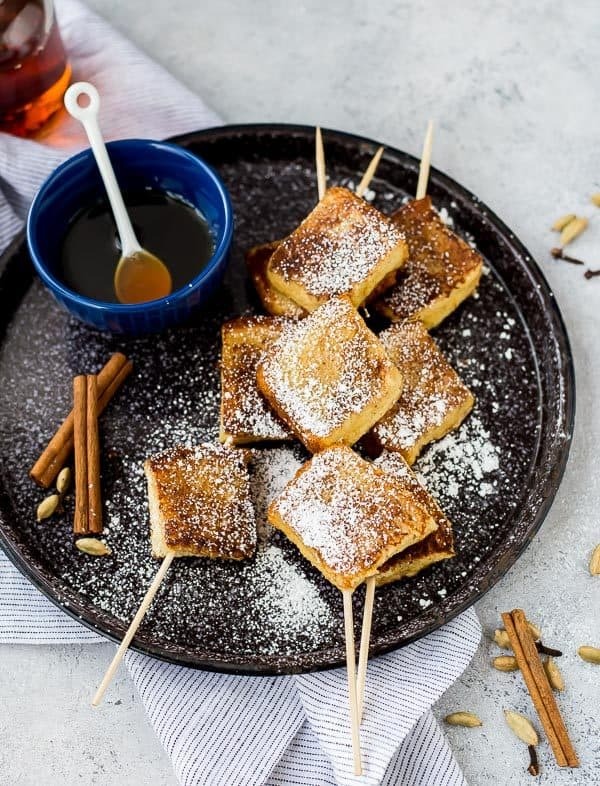 The flavors of chai are so cozy and comforting and are perfect for a snowy winter morning. Husband’s take: Ben’s a MAJOR traditionalist. 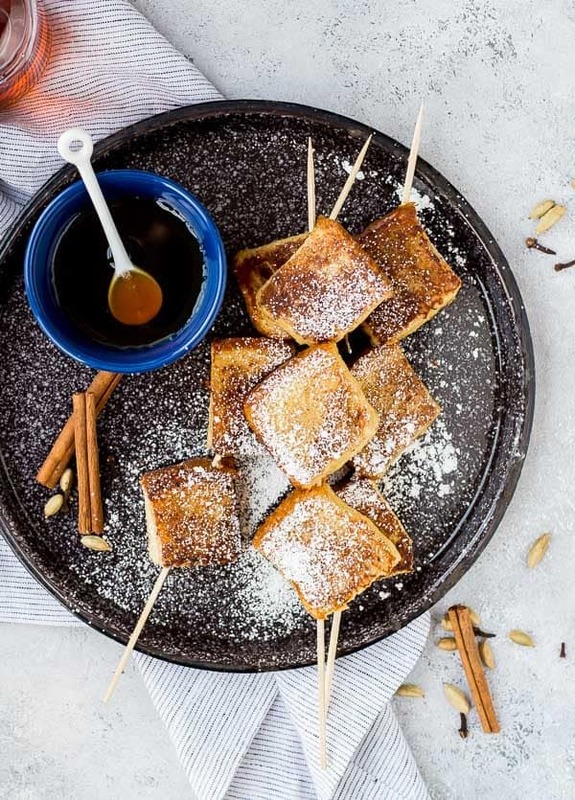 He likes plain or cinnamon French toast better, but he ate this with no complaints.